A powerful guide to spiritual enlightenment -- includes a separate meditation cassette. Throughout the ages, human beings have searched for the key to the mystery of life. 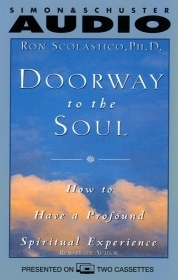 In Doorway to the Soul, distinguished spiritual psychologist Dr. Ron Scolastico tells that the key is in your hand. It is the power of your consciousness. lead you to enhanced creativity and strengthened intuition. Spiritual guidance and comfort are available from your soul in every moment. Bring this powerful approach to meditation into your life and feel the love and wisdom of your soul every day.